When it comes to Search Engine Optimization (SEO) you’re entering into a really competitive, quickly evolving marketing field. Throughout its history there’s been a lot of algorithm updates, new techniques and help from new technologies too. While algorithms weren’t updated too often in 2017, many experts believe this will change in 2018. • Video and image search will improve greatly. This is because our online interactions are slowly becoming much more visual thanks to things like faster internet speeds and more visual-friendly social media platforms leading people to want to see content instead of just reading it. SEO will need to change to keep up with this. • SEO trends have shown that featured snippets are becoming more popular and useful today. However, this is something that Google drastically decreased in the last months of 2017. Instead, Google has started focusing on knowledge graph boxes instead. These offer you specific snippets of answers to the questions you pose to the search engines so that you receive better, more consistent answers. • Individual customization will change how the Search Engine Results Pages (SERPs) are calculated. This is because smart speakers (e.g. Amazon Echo and Google Home) are growing more popular today. With them, spoken searches are changing the way that searches are made. 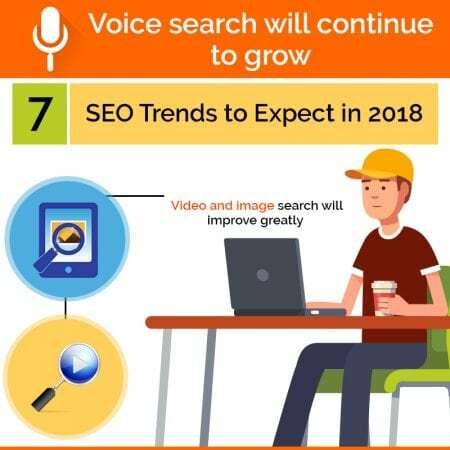 • Voice search will continue to grow and SEO will need to keep up. They’ll need to take things like your personal search history and browser cookies into consideration so that the can give you better, more customized results for your queries. • Future SEO trends will grow more dependent on machine learning instead of being dependent on the human brain. This will slowly but surely start being seen in algorithm updates in that the traditional approach to this will actually no longer exist. • SEO is going to extend beyond Google and Bing – the two search engines that have dominated the landscape for the past few years now. They’re going to start seeing growing competition from third-parties like Yelp and Amazon, as well as digital assistants like Siri. There’s no doubt that Google will continue to dominate, but it’s important to broaden your outreach and start thinking about these other traffic generating sources if you want your business to stay competitive. • SEO trends are leaning more towards “hyper-local results” (results that target customers and present SERPs based on your location – as detailed as within a block of where you’re at when you conduct the search). This is something that’s growing in importance daily. While a lot of people thought that hyperlocal results were going to take off in 2017, this didn’t happen. Undoubtedly this is something that must happen soon. With this thought in mind, most people believe that 2018 will be the year it actually does happen. Although some of these predictions look like they’ll definitely happen soon, others seem a bit riskier. They’re still worthy of your consideration though. Nobody feels that 2018 will be highly volatile, but that there will be changes that shake things up a bit. When you’re ready to start working on your website’s local SEO you’ll want to get to know us here at the Local SEO Tampa of Florida. We’re a very experienced company. Our employees also live and work in this area, which means we have a good understanding of what your business needs. So, when you’re ready to get serious about your website, contact us. We look forward to hearing from you today.